This savory, hearty pie has an easy-to-make, bread-like crust filled with rich, cheese custard. It is perfect for breakfast, lunch, or dinner and makes enough to feed a family with leftovers. It is definitely one of the best things I ever ate! Preheat oven to 350° F. Grease a 9-inch spring-form or cheesecake** pan and place a parchment round in the bottom, if desired. Grease the parchment also. Place dry ingredients in food processor and pulse to blend. Add oil or butter and break egg into processor. Add water and run machine for a few minutes until dough forms a ball. Alternately, dough can be mixed in a bowl with a wooden spoon. Place dough in pan. With greased fingers, press dough evenly in bottom and part of the way up the sides of the pan. Bake crust in preheated oven for 10 to 15 minutes or until firm and starting to brown. Remove from oven. Sauté onion in butter in a skillet for a few minutes until softened. Add garlic and sauté for 2 minutes more. Stir in diced ham or bacon. Scatter onion mixture over bottom of baked crust and sprinkle greens/herbs on top. In a bowl, whisk eggs until smooth. Whisk in sour cream or yogurt. Add salt, pepper, and nutmeg and stir in shredded cheese. Pour into crust. Drop tablespoon-sized dollops of goat cheese over top of pie. Place in preheated oven and bake for 30 to 40 minutes until top is brown and filling is almost set but still slightly wobbly in the center. Note: Cover edges with pie-crust shields if necessary to prevent over-browning. Let cool for a few minutes then slice and serve hot or at room temperature. *Yogurt and kefir show higher carb counts on the labels than sour cream, but because most of the sugar in the milk they are made from has been eaten by the live microbes, they actually have about the same amount of carbs. **A cheesecake pan has a loose bottom. To remove the pie from the pan, you place it over a jar and press down to release the contents from the rim. The small bottom disk remains under the pie. A spring-form pan has a rim that can be removed by loosening the latch on the side leaving the pie on the base. This recipe inspired me to invest in an 8-inch and a 9-inch cheesecake pan, which makes the pie easier to slice and would make a better picture than the one above! 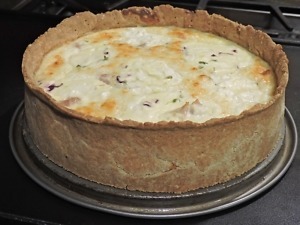 Easy pie crust, Goat Cheese, Hearty Main Dish, Quiche Lorraine. Bookmark. i am worried about sodium…..what i sthe content. I tend to find low carb recipes using highly processed foods, therefore high in sodium and also high in fat which takes up the calorie content. Thoughts? I can’t speak for other sites, but you won’t find many (if any) processed food here. I always use the best natural products I can find and encourage others to do the same. As to salt, I don’t agree with the USDA’s ultra-low salt advice. No traditional population has ever eaten as little as they recommend. Studies show that both too much and too little salt can have negative consequences. I usually say, “salt to taste,” in my recipes, so that is not an issue here. If you are referring to commercial low-carb products, I agree that some of them are not good choices. I love your recipes and this is one I will definitely try soon. I totally agree! The food can actually be better, but you have to think outside the box.